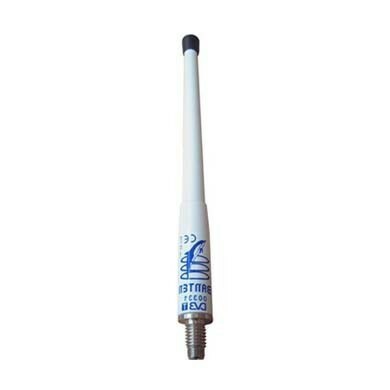 Features: • The new TV\/Whip- style antenna for best reception to the DVBt frequency, whit the Low Noise amplifier. Including sports bracket. • Frequency: 175-240 \/ 470 - 8 60 MHz. • Gain: 24 db. • Impedance: 70 Ohm. • Output Voltage: + 26 dbm. • Noise Figure: 1,9 db. • Power: 12 VDC - 50 Ma. • Connection: Female. • Weight: 100 gr. • Length: 25 cm. • Fitting: Hole dia 12 mm or adapter included for 1\" - 14 thread female. • Cable: 5 mt low loss cable.